I know that lately this Vintage Toy Blog has been on sort-of a "riding toy" kick but I swear I don't mean to be, it just happened like that. I promise I'm gonna be covering a lot more variety than this so please bear with me, ha ha! I just had to do this one because it's kinda special to me. 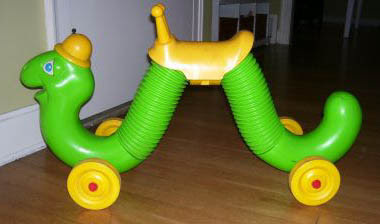 I remember as a little kid my Sister had this, now classic, riding toy by Hasbro Romper Room called The INCHWORM. She loved that toy dearly & rode it every single day. Now, 30 or so years later, these are actually very very hard-to-find, at least the vintage ones anyway. 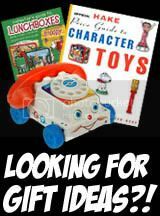 As a Vintage Toy Dealer I found one a few years back. I sold it on eBay & it did very well. I sold it around Christmas & I guess 2 or 3 people wanted it real bad. Ya know, as a perfect xmas gift idea! 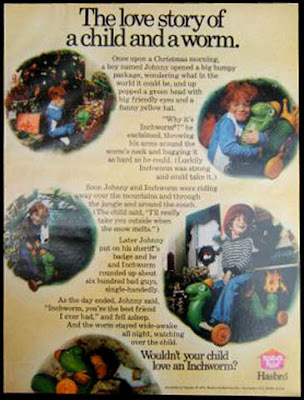 Anyway, this was a ride-on toy by Hasbro Romper Room that is now super-classic. 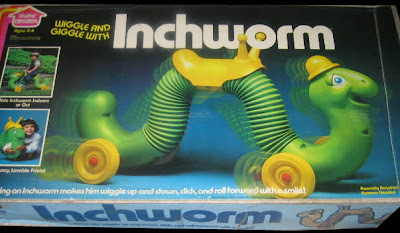 Right here I'm showing you the Original Box ( wonderful graphics ), the Actual INCHWORM Toy, a Vintage Magazine Toy Ad, & a very cool YouTube video of the Retro 70's TV Toy Commercial, enjoy! I had one of these when a small child, now 39 years old. I think I seen one at the local Orschelns farm and ranch, but can't find it anywhere else... I called and ask them if they still had it and how much it was. They said it was their last one and that it was the display. They wanted 35.oo for it on sale. I'm going back after work today and check if this is for the same as the 1970 style and made be Hasbro, if so I will probably purchase it for a friends two year old. i loved that dam thing, till some1 ran it over :( lol was great toy ..